Chimichuri sauce is traditionally served as a condiment for grilled meat in Argentina, but you'll want to put it on everything after trying this delicious, simple recipe. The sauce is a flavorful mixture of fresh herbs, garlic, lime juice, vinegar, and olive oil with just a little bit of heat. For an authentic Argentinean experience, grill your steak outdoors on a charcoal grill until just medium-rare. This quick and easy recipe is paleo and Whole-30 friendly, and is ready in under 30 minutes. Enjoy with a glass of dry Malbec and grilled vegetables. Not grilling weather? Sear the steak in a stove-top grill pan or cast-iron skillet. Leftover chimichurri (if you have any!) can be refrigerated for up to one week. Or make a double batch of chimichurri and serve the leftovers with grilled chicken thighs, roast potatoes, or even on scrambled eggs! It also makes a nice dip for crusty bread or a spread on a roasted veggie sandwich. Per Serving: 585 calories; 50g fat; 1.9g carbohydrates; 32g protein; 90mg cholesterol; 170mg sodium. 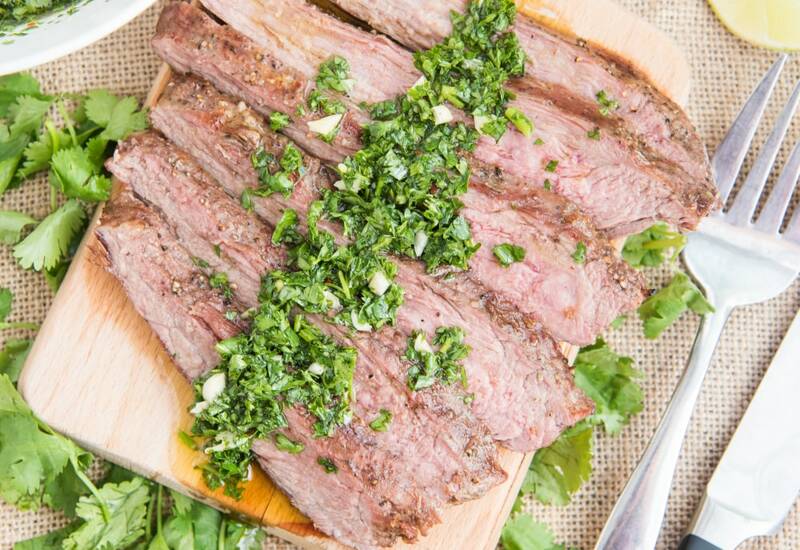 This chimichurri brings so much bright flavor to the juicy hot steak. I used a pinch of ground chipotle pepper when seasoning the flank. Worked well with the sauce. Great summer meal. With a flank steak you want to make sure you cut it against the grain and thinly so that you don't get tough pieces. Top with chimichurri sauce and you have a winner. I love chimi sauce. its great on top of rice steak. this was really yummy. I've wanted to try this for so long! I did ribeye with the chimichurri sauce and served it with Brussels sprouts. It was fantastic. Made reverse seared steak in my cast iron skillet and served with the chimichurri. Great recipe, full of flavor. Didn't even need any sides with it.